Simple Lovely: The First Blogger's Favorites of 2010 -- Christiane Lemieux of DwellStudio + A Giveaway! The First Blogger's Favorites of 2010 -- Christiane Lemieux of DwellStudio + A Giveaway! So for our first "blogger's favorites" of 2010, I'm thrilled to feature the founder and creative director of DwellStudio, Christiane Lemieux's list. And...(it gets better) not only has Christiane taken the time to kindly share the things she loves most with us, but she's also offering up a set of DwellStudio sheets (of your choice) to one of my readers! This is such a fab giveaway, I wish I could win it. Just leave a comment on this post by midnight Thursday, January 14th. I'll announce the winner next Friday! Good Luck. Now without further ado, herewith Christiane's favorites. Enjoy and have a great weekend! Joslyn ­ thank you so much for including me in this feature. It is a really great exercise to think about my favorite things. How often do we all really get to focus on that? This is something you can approach in so many ways but it goes without saying that my four most treasured favorite things are my husband Josh, my daughter Isabelle, my son Will and our dog Jake. That said, it seems most intuitive for me to start at home. That is after all what do here at DwellStudio. New York -- I love New York ­ I am not American and so I always feel like I am just passing through which allows me never to take my time in this great city for granted. I love Paris, Rome, Tokyo and a myriad of other places but as I drive in from the airport after a trip and I catch a glimpse of the skyline­ I still can¹t believe that this is home. This city is amazing. 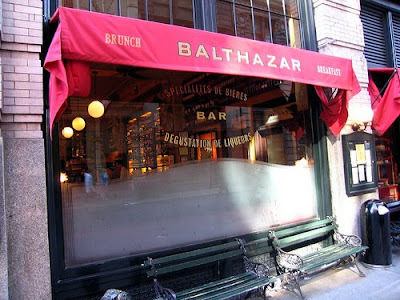 Breakfast at Balthazar -- This is one of my favorite spots in New York. It is steps from my apartment and has the greatest vibe in the morning when all the neighborhood regulars are there. It¹s like Paris meets New York… what could be better? My kids call it the restaurant. The Museum of Natural History -- I love a diorama. I find them so chic and evocative. They tell a story of the animals and people who sponsored each window. 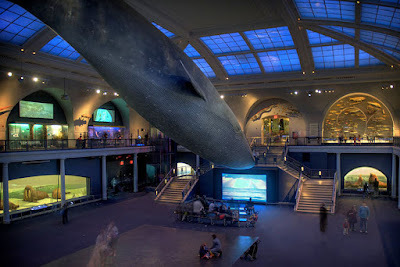 There is nothing better than the whale in the hall of Ocean Life. Anytime anyone suggests a trip - I jump. 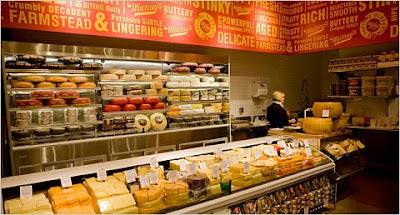 Murray¹s cheese shop on Bleecker -- I love cheese…cheese with breakfast, cheese with wine ­ cheese anytime. What can I say? I am French Canadian. My sister-in-law gave me a cheese of the month for a birthday gift. It was perfect. Murray¹s is the temple of cheese in my neighborhood. Sleep -- I also love sleep- It is probably my single greatest love. Ever since my two kiddies came along, I would probably choose sleep over almost anything. There is nothing better to me than when my head hits that cool pillow. I am in love with our percale linen edge sheets from Portugal. Equal measure soft and crisp and always cool. Perfect. Marni -- I love the Marni Spring 2010 collection ­ the New York store is around the corner on Mercer and I dropped in to check it out. Amazing ­ in person the details are stunning. Equally gorgeous is the jewelry this season. 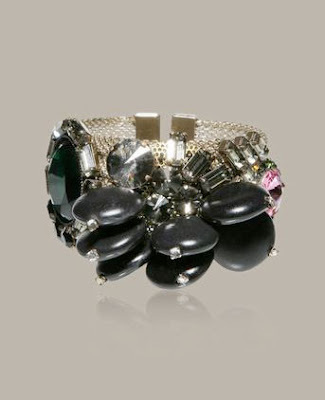 Love this cuff. Target -- I love Target, and not just because I work with them ­ because I really really do. Where else can you get a Rodarte dress and Lightening McQueen wrapping paper in one shop? Every time I go in I find myself asking total strangers ­ can you believe how good this thing is and it¹s only two dollars?! 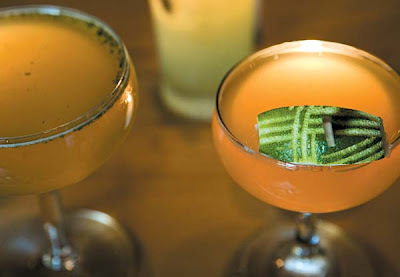 A Good Cocktail -- It just so happens that Pegu ­ a lounge that delivers a famously amazing libation is on the corner of my street (what good luck?). Sometimes after the kids are tucked in and the dads are on duty­ I meet the other neighborhood moms for a late drink. We all have our favorites but the Old Cuban and the Earl Gray Martini are chart toppers. I love so many things... travel, food, reading, magazines, movies, art, dangerous sports, etc but the things on this list are all in a 4 block radius of my home (ok ­ I have to jump on the N train to get to the museum). Thank you NYC. She makes me want to get on a plane and go to NYC today...thanks for the chance to win!! I have to whole-heartedly agree, Josyln, the people, the styling, the quality at Dwell are all amazing. I think this company is top notch in every way. I'm fortunate enough to own a number of sets of their sheets and they are my absolute favorite. 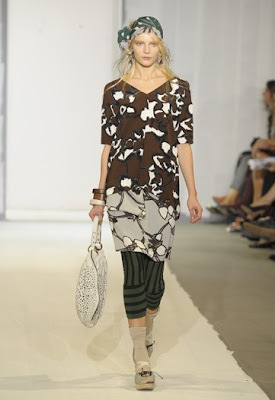 Especially the beautifully detailed, whimsical children's line! I love Christiane's list. I think there is no place on earth which exudes the magic that NYC does. Nope, no place. So to have it as your personal backyard, wow! I could really use some new bedding! Love her favorites - bookmarking this for my next trip to NYC. cheese and sleep. my two faves as well!!! Great list! Cheese, Target and sleep... I'd have those on my list too! Thanks for the opportunity to enter this fab giveaway! I love Dwell bedding! I have their Target line in our guest bedroom, and it's so fun and lively! Fantastic giveaway! I'm with everybody else -- bring on the cheese. Excellent list. I too love NYC - don't live there but every time I'm there I get awed by the magic of the city. Cheese & Target are among my favs too! I'd love some new Dwell bedding. i am a dwell junkie who recently had to retire her last set of sheets after we upgraded to a larger mattress. Mmmm... Murray's Cheese Shop! I first went to Murray's on a food tour of the Village. It was the best. 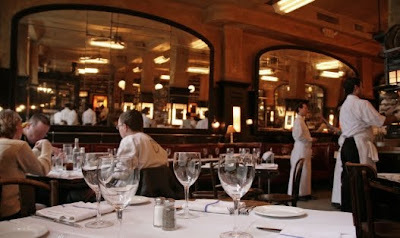 So was our dinner at Balthazar. I love Dwell and this blog, which I have just discovered!! what a lovely giveaway! crossing my fingers! Perfect! My daughter and I were just last night discussing the merits of taking the megabus for a day trip to NYC (we're in Philly). This post has pushed over the definitely we're going side! I always buy Dwell from my local source - Tabletop DC! We are vacationing in New York this summer...the city and then the Gunks. I added the Museum of Natural History to the list. My husband and I have never seen the dioramas. i am in love with their chinoiserie sets. birds are my fave. Reading this makes me want to go to New York! Winning Dwell sheets would be super too. I am a fan of Dwell! Those would look amazing on my new (and empty) apartment. What a lovely interview and talk about an amazing giveaway! I can just picture how cute my room would look! Crossing those fingers. Wow, all of my fav things in one post! The Natural History Museum, Dwell, Target, bedding! I love Dwell & need new sheets pretty desperately! I have a bunch of their Target baby stuff and it's so cute without being overly precious or tacky. Wow I really like those sheets! And great NYC tips! Thanks! 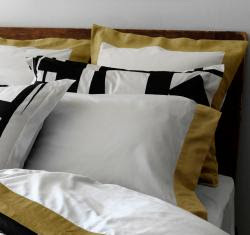 I love sleep as well, so a fresh and gorgeous set of sheets is such a perfect giveaway. I could definitely use a new set of sheets to go with the new bed we're buying this weekend! I love dwell. Sublime seems to be the only word I can use to describe her list. Great give away too! what great favorites. I am a huge fan of sleep too, well that and good cheese. Dwell is a favorite of mine too. All of those places look marvelous. The martini looks especially delicious. Yum! I'm getting a real itch to escape to a big city soon--it's been far too long. NYC, here I come! That cheese shop looks amazing! I just discovered Dwell Studio and your blog and look forward to learning more about you both! Thanks for sharing your list Christiane! My husband and I just got married a month and half ago and are in the process of feathering our nest. 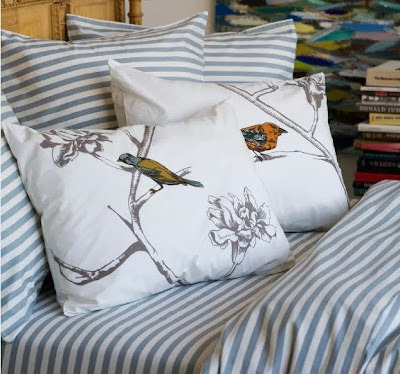 We don't have a ton of money to spend, but if I don't win the sheets, I may have to splurge on the draper stripe in chinois blue anyway--too lovely! LOVE Dwell, and LOVE the birds! Oh I love NYC, cheese and Dwell. What a great list. I love Dwell! The Dwell for Target kids stuff has been really cute lately. I wish I had someone to buy it for! You and I have a love of DwellStudio that is the same. Lovely list. I also have two little kiddies. I have my 3 year old hooked on having his pillow flipped to make it cool. Would love a new duvet!!!! Fingers x'd!! I am a big fan of Dwell Studio as well! I have definitely taken advantage of the Dwell Studio for Target stuff for my son. This is a great giveaway! Thanks! 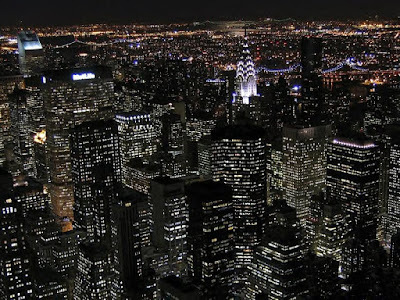 This post makes me not only want to check out New York, but to live there. Everything sounds elegant but cozy, something that I never perceived the city as being. Thanks for sharing! those are very nice favorite things!!! i've never heard of dwell but really like what i see. I've been eyeing some Dwell goodies recently! Love this list of favorites! We were just in NYC in October and after reading this list I'm ready to go back and enjoy all the city has to offer again...and this time I'll focus much of our time on these fun favorites! I'm in NYC, too. I love that while I know many of these places, because I live in a different 'hood my day to day only includes them when I make a special trip - one of my favorite parts of New York! The endless variety! Would looove a set of Dwell sheets. Thanks for the chance! I often lust after DwellStudio so this giveaway is fantastic! Ohhh Christine, as a Canadian I know how it is to love NY. We love our own country so much that we are always amazed when we find an other that we love as much. To my own list I would add Vancouver city (as I am an avid Montrealer) for the mix of urban and nature, the cool little places and the fact that you can go to brunch on a Sunday in your Yoga pant and look cool and not at all out of place. And Paris for the magic, the fact that it is an open-air museum and that my in-laws live there. OOOH, what a fun list! I would have to include Dwell Studio on my favorites list, so winning would be oh so sweet. I fell in love with Dwell after they designed their baby decor line for Target... with baby all decked out, it's hard to stop wishing and hoping for a Dwell bedding set for me! Oh what a lovely list and wonderful giveaway! Christiane's list makes me want to get on the next flight to NYC! Love the blog; love the list! Thanks! Wow, great shop and great list! 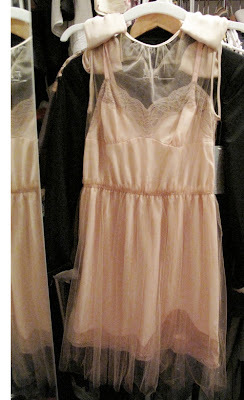 Winner or not, I may have to indulge in a set of those linen-edged ink and pearl sheets...yum! I love DwellStudio. I would fill my home with it if I could. Love the birds! What an inspiring post! Thanks for brightening and invigorating my day. DwellStudio sheets! Yes please! Thanks for this giveaway! It's a good one. I love the saffron trimmed sheets. Swoon. Someday I will be able to afford them! I love that Christiane balances having a family and running a successful business; something I aspire to. She and the Dwell staff have impeccable taste. The other day I received the most recent Dwell catalog and wanted to buy half the things in it! I love dwell, too! They have sample sales about twice a year in NYC. Totally worth making a trip for! Those linen edge sheets are perfect! Wow! I forgot...my 8 month old loves his elephant decor in his nursery. Of course it's the brown and blue dwell studio for target!!! Loooooove it!! These sheets are gorgeous! I love Dwell so much! I've only had the chance to go NYC once, but I'm hoping another trip is in the works sooner than later. These sheets are gorgeous. I love the linen edge ink/pearl sheet set. It's just beautiful (especially at 400 thread count). i became engaged while visiting NYC so it has a special place in my heart too. i also love those pillows! I stopped by the DwellStudio web site and fell in love with their bedding as well as their tabletop collection. I'm keeping all fingers crossed for the giveaway. My husband and I are moving into a new home in several weeks. It would be lovely to have new bedding for our fresh new start. Thank you, DwellStudio, for this wonderful giveaway. ugh, totally agree. nyc and target are definitely chart toppers. and I would TOTALLY love to win these sheets, I just got engaged so these would be perfect in our new home! wow. i love her. i literally found myself saying (out loud in some instances) 'uh - i love that toooooo!' every. time. i don't know why i'm even sort of surprised at how taken i am with her. both beds in my home are outfitted in dwell and i too look to their styling for near constant inpiration. great post Joslyn - thank you! I would love to get my hands on those sheets! They're beautiful and so is her NY neighborhood! My good friend used to live on Bleeker and everytime I visited her in NY I would invade Murray's -greatest cheese shop on earth. The sheets from Dwell are fabulous. Love Dwell!! The styling is just amazing. I'm left wanting to plan a trip to New York immediately! I love that her kids call Balthazar "The Restaurant" Hilarious. I definitely share her love of Target... When the spending hiatus comes along I have to stay at least 50 yards away from there, for fear of being sucked back in to it's wonderful orbit. Lovely post, a perfect list to start out 2010! those chinoiserie sheets are to die for. What fantastic sheets- and thanks for the chance to day dream a bit about cheese and sleep and cocktails! I would have to say I agree with a lot of these favorites, but especially sleep! And I'm sure I would love sleep even more with some DwellStudio sheets! I resolve to sleep on fantastic sheets. Will you help, please! What a perfect post - just got back from visiting NY and miss it already! I have never met a cheese I didn't like. And I have never seen a set of Dwell sheets that I wouldn't love to have on my bed! Thanks for the giveaway opportunity. Wow! I love everything Dwell. Excellent post! I didn't know about Dwell, so I'm doubly excited both to find out about it, and for the chance to win!! We desperately need new bedding, and this set TOTALLY matches our aesthetic!!! Thanks for the chance!!! i feel so silly stepping out of anonymity to comment on a giveway. well, not silly so much as completely cliche. however, dwell does that to me. so, i promise to comment more often, considering i read you daily. would love some real dwell sheets, even though my target versions are pretty great too! Sleep is my favorite thing, too. And crisp new sheets are the best! what a fabulous giveaway. i adore anything Dwell. I dream of owning DwellStudio sheets. What a great post - ah, I miss New York. I hope she posts about her job, I'm very curious on what she does day-to-day. Oh my gosh....this would make all my dreams come true! Wow, that would be so wonderful to win! Friday can't come soon enough! I would love to win! We have a california king, so new (free) sheets are always appreciated! i was just looking through dwellstudio's website yesterday and admiring their simple, stunning design... pretty much perfection. Who can't use new sheets! Thanks Joslyn! Was in NYC in Oct, and keep wishing I was still there! Love the favorites. Um, I think she's my new imaginary best friend. Can't imagine living just steps from Baltazar. It's my ultimate comfort food experience in NYC. And sleep? LOVE sleep. Oh, she is quite an inspiration. I love Dwell. I can't wait to have babies so I can buy some of their children's line. What a great giveaway! Oh me, Oh my, I want those sheets! Would love some new sheets....Thanks for the lovely blog. how awesome! i love the dwell studio bedding - and she sounds fabulous! dwell studio bedding is the best! loved this post! ... and there's that Chinoiserie set I covet. Beautiful! We've been using our old college dorm sheets. For some reason, we have never got around to getting a new set! Dwell Studio has such lovely designs. The "Linen Edge Ink/Pearl Sheet Set" is my favorite. Love this list! Makes me wish I were going to NYC sometime soon. I gravitate towards anything Dwell even before I know it is! I love it all but cant always have what I want! Here's hoping for sheets! She is adorable, the sheets are amazing, and I love her list. Now I want cheese and a free trip to NYC! I we NEED new sheets. What an amazing giveaway! I was just on their site and then saw this-so great!! i really want those sheets! I Love DwellStudio and this is the perfect list of Blogger's Favourites, wish I'd known about Pegu when I wish in NY a few weeks ago! Wow seriously selling me on NYC life and that bed looks sooo inviting! count me in! Someone who loves new york as much as I do! Fantastic! 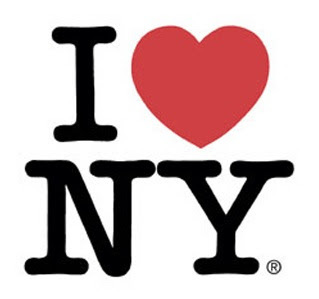 I heart NY too and sleep! Would love some new sheets! Those sheets are divine. I hope I win. Also, I wish we had Target in Canada. Thanks for the chance! We are in desperate need of new bedding and I don't think we can wait until our September wedding! Gorgeous bedding! Love love the birds. What an awesome giveaway! Thanks for the opportunity. I love DwellStudio!! Oh yes, yes, yes to some new DwellStudio sheets! Are they as amazing as they seem? Thanks for the giveaway! Loved reading about her favorites. I absolutely adore Dwell Studio and would be so excited to win a set of her sheets! Awesome, what a fantastic giveaway! I recently realized all our sheets are plain ivory. Dwell's patterns would be a welcome change. I'm crossing my fingers! New sheets from DwellStudio would be wonderful!!! I am newly pregnant and was JUST thinking that it's time to revamp the bed--because it's such a treat to crawl into these days! DwellStudio sheets would make it even better, that's for sure. I love Dwell Studio! The bedding is awesome, and their kids clothing at Target is so cute! Of all the giveaways I've ever entered, I think this is the one that I want to win the very most. Dwell Studio sheets make every bedroom look instantly chic. I love dwell studio! Fingers crossed! Wow, I'd love to win this; I'm more of a Target Dwell shopper than a Dwell Studio shopper, so it'd be such a step up! She seems lovely and smart - great combo. I also love these sheet. I hope is me! I really like your blog. Thanks for the inspiration. I love a beautiful bed! yay! i love dwell and seeing christiane's favorites! I have been eyeing that very striped bedding at Dwell for quite a while now! I love it. What a great list Christiane! After my home town (Sydney) Paris is my favourite city in the world, but NY is a very, very close third. No other ploace in the world has that exciting centre of the universe vibe. A very lovely feature, this is. :) Hope 2010 brings all that you wish for. Um, count me in on this giveaway. When I read her love for Target I knew we were kindreds. My feelings about DwellStudio are much like yours! Are we going to continue to see more and more Dwell in our local Target stores? I'm so glad I found your blog today through DesignMom. Can't wait to see more! Her list could have been my list! Except I could never have said it so chic-ly as she did! I hit up the dwell studio Website everyday wishing away several minutes before coming back to my budget reality! I sure would love those sheets! Thanks to both of you for the chance! what a lOVELY giveaway! I love their line at Target. I love the bird pillows. Lovely giveaway - fingers crossed! I wish I could decorate my entire house with Dwell. What a giveaway. Thanks. I want to win. Love your blog and love this post!! NYC rocks and so does DwellStudio. Just about perfection. All of it. Dwell's beautiful bedding is actually what initially lured me away from my steadfast love of all things victorian and into a more fresh, modern style. I scrimped and saved during my pregnancy to buy my new baby an entire set of dwell baby bedding but still don't have a set of my own. fingers crossed! Oh, goodness. I would LOVE a set of DwellStudio sheets and I fully blame your blog for fueling my addiction. Great post & giveaway! oh my, I love love love Dwell. Everything they make is perfection--totally agree with you!! Ooh, I love Dwell so much! Fingers crossed! yes please. our new mattress needs come covers. I miss living in NY! Love Dwell, too. Great post - makes me want to visit NYC. And the giveaway is great, too! Early gray martini? And Dwell sheets too? !Yes please! i heart dwell studios! and simple lovely, too! A lovely list, makes me want to visit NYC again. Would love to win the sheets, they are so pretty, and having just had surgery, I will be spending a lot of time in bed, curled up with my laptop. I love love love those sheets! Great faves list and lovely work from Dwell Studio. Great giveaway too! I love it! My husband and I are visiting my sister in New York in April, and now I have a few more ideas of where we want to go. Especially the cheese shop. I love cheese! Thanks for the great list. An Earl Grey martini?! Wish I lived around the corner, so I could meet you for one! I*heart*NYC, too. Thank you for the inspiration, Jocelyn! love the bedding... so crisp and cool. What a generous giveaway! Thank you for the chance to win. I love those exact sheets you pictured and have been lusting after them for awhile! I love those cushions! Where can I get those? Just had a look at the site - all the designs are wonderful! Wow, I'd love to swap out a set of my very boring sheets for a set of Dwell's lovely ones! I was just talking about how much I would LOVE a new set of sheets! Love! It helps that Dwell Studio is one of my favorites. New sheets for the new year...perfect! i always look forward to your blogger's favorites! and i must say i am obsessed with dwell and have been pining over their sheet sets for so so long. i would love to win such a fabulous giveaway!! Please enter me! I am decorating me and my boyfriend's apartment and it is in dire need of some dwell sprucing up! love dwell, cheese and cocktails. and target...i couldn't live without it!!! Oh what a dream come true it would be! I so need new sheets!